Does a big wheel in front, smaller wheel in back make sense? The Foes Mixer Enduro features 6.5-7″ of rear travel and rolls on a 29″ wheel in the front and a 27.5″ wheel in the rear (click to enlarge). 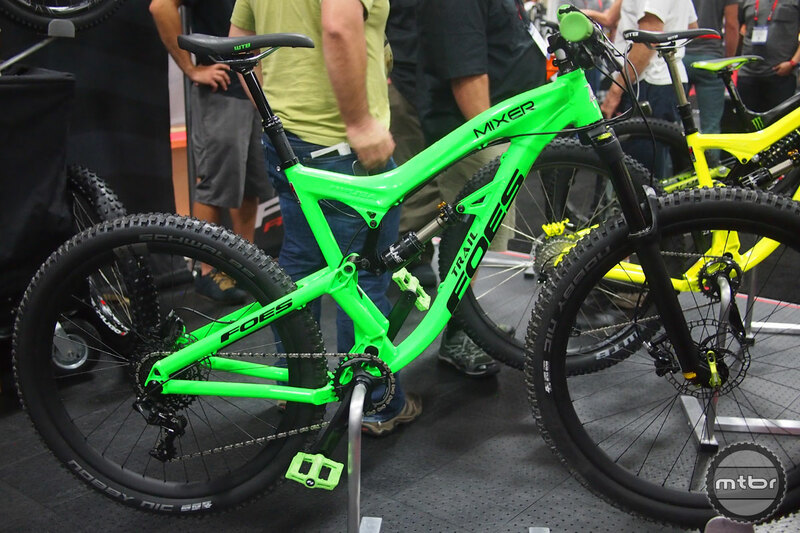 At Interbike this year, Foes Racing had one of the most unique bikes on the show floor. Actually, they had two. The Foes Mixer is a “mixed wheel size” bike that is available in two flavors. The Mixer Enduro has 6.5-7″ of travel and the Mixer Trail has 5.5-6″ of travel and the bikes features a 29″ wheel in the front and a 27.5″ wheel in the back. We had a chance to chat with Brent Foes in person and here is what he said. Mtbr: What is the idea of the big in front and small in back mixed wheel bike? Brent Foes: The idea behind it is that with the bigger wheel in the front, your axle is higher up than in the rear. So your approach on everything allows the front to be picked up a lot easier. Plus when you are going into a corner and leaning, you can get over the front end of the bike easier. With the smaller wheel in the back, it wants to follow the front a lot easier since the two wheels of a bicycle naturally swing in two different arcs. So we took this idea and decided where we wanted to be at with the bottom bracket height and the head angle, and then built the bike around these two wheel sizes. Mtbr: Where did they idea for this come from? Brent Foes: One of my long time dealers from Colorado Springs actually approached me about the idea first. Now, the Mixer is what he sells almost exclusively and the shop is sponsoring a kid who is racing this bike and has done really well in the Colorado State Championships. The shop is Timberline Cycles and the owner is Mike Vidovich. 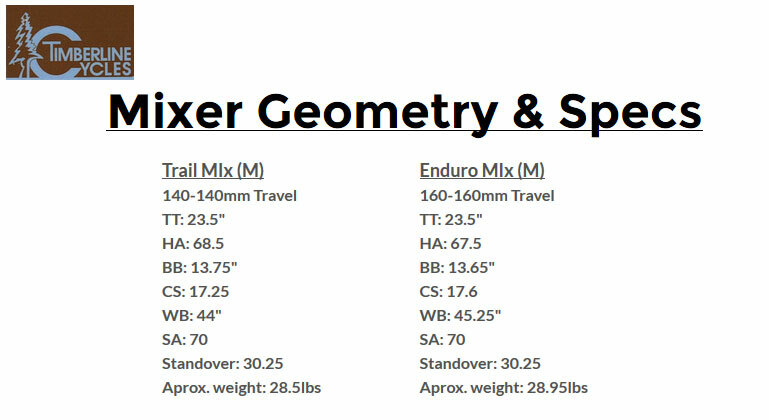 The Foes Mixer Trail has less travel than the Enduro version with slightly steeper geometry (click to enlarge). At this point in my conversation with Brent, Timberline Cycles owner Mike V. actually showed up and was able to tell me a bit more about how the idea became a project, and the project became a reality. Mtbr: Mike, obviously this isn’t the first time a mixed wheel design has been tried. What makes this different from what others have tried (and failed) in the past? Mike V.: Other brands have tried big/small wheel combinations with 26/24 and it failed because the wheels were too small and the handling suffered. A few years after that, with the advent of the 29″ wheel, another big brand tried the 26″/29″ combination but it was too hard to synchronize. The contact patches were so different that a lot of riders felt that difference and didn’t like it. Now, with the popularity of 650b (27.5″), we have a tire combination that is closer in size to each other, is bigger not smaller and it works. Mtbr: How did you decide to work with Foes on this project? Mike V.: I sell and own many brands of bikes with many different suspension designs. Brent has evolved his iteration of the simple, single pivot design to the point where it is rock solid with no twisting, no brake jack and because we knew it was U.S. welded, we knew Foes could bring it to the table today. Long story short, we built it, manipulated it, raced it and tested it on the retail floor and the performance advantages are amazing. Some people claim that 29ers have to be symmetrical to carry 29er speed, that’s not true. 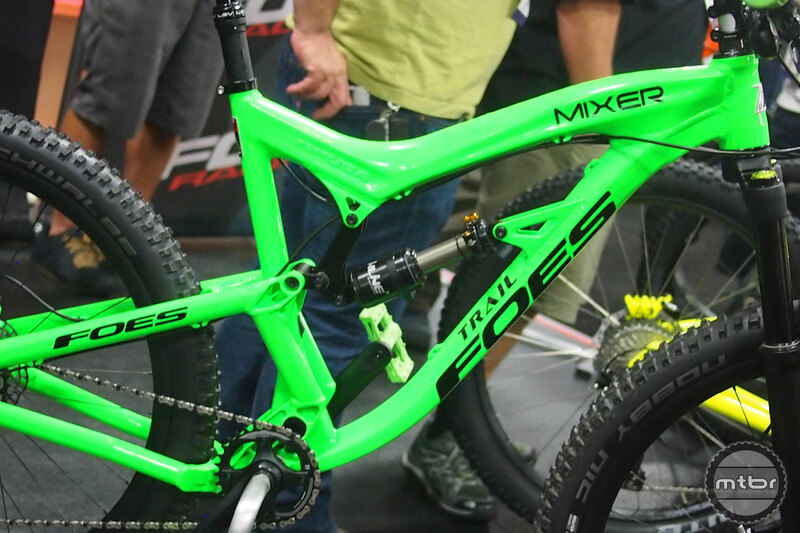 The Foes Mixer carries 29er speed, even with the 27.5″ in the rear. What we accomplished with the Mixer is that we put the handling back into a 29er. This bike handles like a 650B (27.5″) with the tighter, shorter rear end. One of my sponsored riders won the Pro Junior DH class for his age group racing on the Foes Mixer. His race bike comes in at 29.5 lbs. with a single crown fork and he crushed it. He’s running 66.5 degree head angle on his bike he’s just crushing it. He got 4th in the state against everyone which is amazing because the local DH scene in Colorado is hyper competitive just like California. 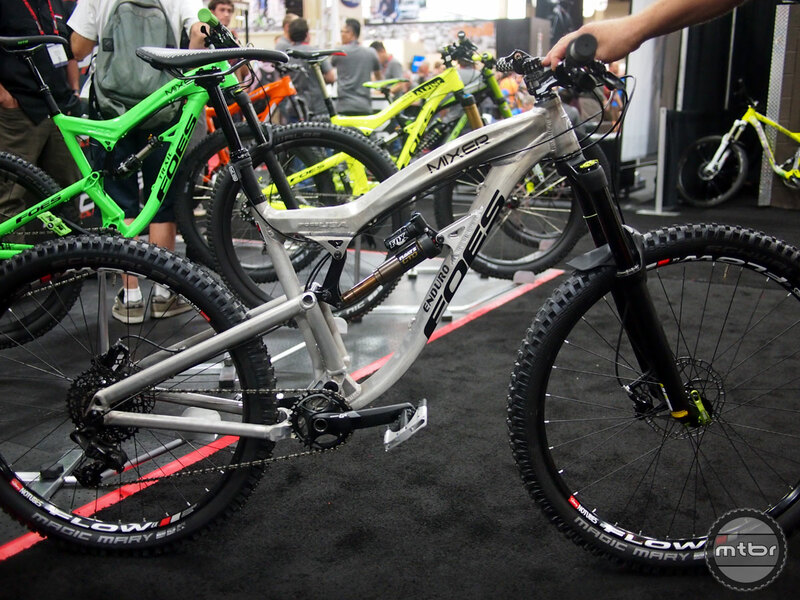 Check out Timberline Cycle’s highlight video below of the Foes Mixer in action. Mtbr: Anything else you’d like the mountain biking world to know about the Mixer? Mike V.: Yes, for sure. Our conversation wouldn’t be complete without a few words about the Mixer’s geometry. We call it CAP geometry which stands for Constant Attack Position. 29er hubs from the ground up are 15″. A 650B is 14″ and a 26″ wheel is 13″. By having the front hub higher than the rear hub and nominal to the bottom bracket placement, you can charge rock gardens with reckless abandon. Our racers are carrying crazy speed through rock gardens even on their first run. The front hub is always going to go up, not auger in. You’re driving forward under the hub. This is mixed wheel done right. Courtesy of Timberline Cycles – Colorado Springs, CO (click to enlarge). 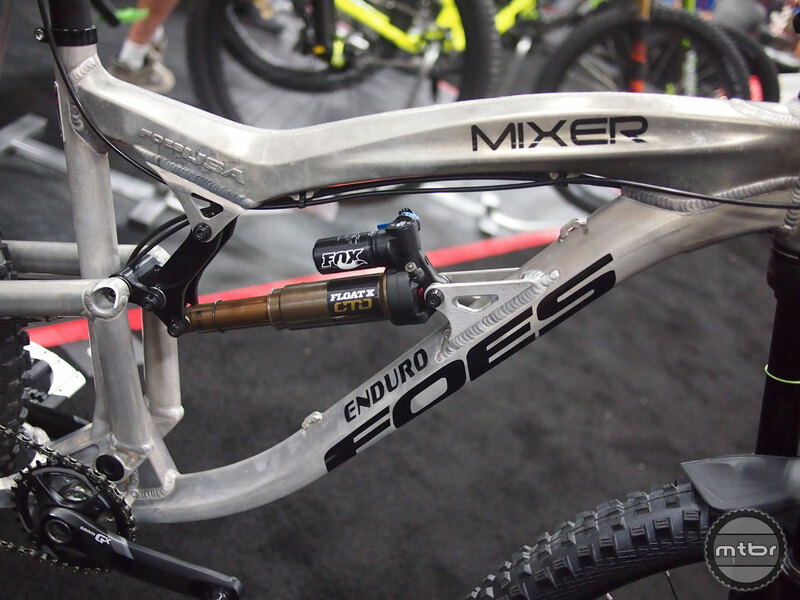 The Foes Mixer Enduro and Mixer Trail are available with complete bike builds starting at $4000.00 and they go up from there. With a decent parts spec, the Mixer can be built up with a bike weight of 28.5 lbs with no pedals and no dropper. We applaud Mike and Brent for taking a new idea and bringing it to light. Will the mixed wheel be the next big thing in mountain biking? Not likely. But for certain riders and racers out there, there are some distinct benefits and characteristics that have some appeal. Both Brent and Mike have a good, real-world grasp of this bike’s popularity and for those that so choose, they have models available now. To learn more about mixed wheel bikes, visit https://www.timberlinecycles.com/mixed-wheel-bikes.html. The Foes Racing website has not yet been updated with these new bikes, but to learn more about Foes other models, visit www.foesracing.com. The Foes Mixer Enduro features 6.5-7″ of rear travel and rolls on a 29″ wheel in the front and a 27.5″ wheel in the rear. The Foes Mixer Trail has less travel than the Enduro version with slightly steeper geometry. Courtesy of Timberline Cycles – Colorado Springs, CO. I have owned a Foes Mixer now for about 1 month and wanted to share my thoughts so far. I have been riding an Intense Spider 29er for 4 years prior to this bike. I get out riding about 3+ times a week and would consider myself an advanced rider. So far the Mixer is a great ride. The bike seems more nimble and responsive than my Intense. Going up hills I get that nice roll over up front and when I really pedal hard I can feel the bike has more acceleration than my Intense. Going down hills the smaller tire in back really does help with drops (I am going off drops where on the Intense I would feel like I wanted to launch over the bars) with a lot more comfort and stability. When the trail has more turns the front wheel performs like my Intense but the back seems to take a tighter line through the curve (I start the curve a bit forward, I then move back over the rear wheel) and the bike will whip through the curve. As an avid moto rider for some 15 years now, the idea of applying similar geometry and principles to a mountain bike made sense to me, especially for the trail and downhill riding here in Colorado. Not to disparage anyone’s previous attempts at this, but I think what really makes the MIXER special is that it was designed around this wheel setup, so the geometry is right and there’s really no compromises. Reading Mike’s description of the Constant Attack Position (CAP as he called it in this article) really made sense and made me want to try it out. Add to that FOES reputation for craftsmanship, and their long history in suspension innovation, I couldn’t wait to ride this bike! Finally got a ride on the TRAIL version this week; my suspicions were confirmed right away. It handles as good or better than my 27.5, but the raised front hub and extra circumference up front makes everything so much smoother and faster. I expected this in the downhill, but what really surprised me was that it climbs better than my bike too, especially up technical stuff. This bike is work of art and innovation. With the “Made in the USA” proudly and prominently stamped on the side of this bike, what’s not to love? Great work FOES and Timberline, and big thanks to Mike V for letting me test it out. I’m definitely a believer, now I just have to convince my wife that I need a new bike! I got to demo the Foes Mixer Trail and Enduro last weekend in Pueblo CO. I have been riding moto/enduro for 30 years and DH racing 8 years. Both bikes seemed to flow over technical sections well, they kept the momentum over rocks and logs. They seemed to corner more like a moto bike where you can shift your weight to the front wheel and then the back wheel follows. Climbing is much better than other mountain bikes I have ridden, they climb technical sections well. Thanks Mike for letting me demo these bikes! I have been riding the Foes Enduro for a couple months now and on into the snow. I have rode all the technical trails here in Colorado Springs and have rode this bike on 50+milers on dry trail to 6 inches of snow. I can tell you that this bike is amazing and as Erik has expressed above you do weight the front wheel and the back follows. I have been Mountain Biking since 1993 and have ridden about a 100 bikes but have not experienced any one bike that handles as good as my Enduro. I also have put a Surly Dirt Wizard 3.0 up front and a WTB Trailblazer 2.8 in the rear for rough conditions, or for plus biking and the bike accomodates the tires perfectly. A single pivot design enhanced by Timberline Cycles with his moto background in mind. Long term test continues!